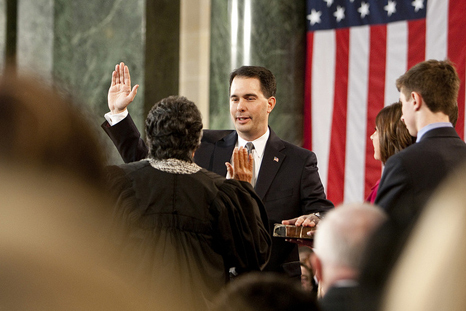 Why Did Walker Flip on Common Core? And why is the opposition to it so heated? An analysis of the actual standards and the arguments against them. When Scott Walker was elected governor, he was a strong supporter of the Common Core State Standards, which define what students should master at different grade levels. Yet now he is asking the legislature to repeal them. What happened? When the governor took office, the only serious opposition to the standards came from segments of the left such as Milwaukee’s own Rethinking Schools that are suspicious of any effort to measure what students learn or to set goals for education. Since the standards development process was heavily backed by most of the business community through the Achieve network, the politically risky path would have been to oppose them; supporting the standards was risk-free for a Republican governor. For that matter, despite some opposition from the left, every Democratic governor supported the Common Core. Since then the groups on the left have been joined by the much more vocal Tea Party groups on the right. To a large extent, these seem to be the same groups who deny the science of global warming including the Heartland Institute. PLEASE WISCONSIN!!! REJECT COMMON CORE!!!! 5. Math will now be based on “feelings” and on a students ability to argue their answers rather then equations and work. 6. Bill Gates (co-creator) says it’s good enough for our kids but not for his. 7. When the federal government stops subsidizing the expensive test system ($30-$60 PER TEST!!!) it will be unsustainable at a local level! PLEASE, THIS IS NO UPGRADE TO EDUCATION! I honestly believe it is the deliberate dumbing down of America but you have to decide for yourself. I will be removing my children from any public school that implements this system. PLEASE, DO THE RESEARCH YOURSELF! WE WANT OUR FUTURE TO BE ALL THEY CAN BE, NOT CORPORATE ROBOTS CUSTOM TAILORED AT A YOUNG AGE FOR ANY COMPANY WILLING TO PURCHASE THEM! It is unclear why learning math, reading, and how to write research papers would destroy the “American dream” but this certainly conveys the level of hysteria the Tea Party folks have built up. Since the standards issued so far are only for math and English literacy, they would not be expected to cover history or art. They do expect students to read literature, not just informational text. One has to question whether whoever wrote these comments actually read the Common Core standards. The reference to a “circle and tally” system for division is mysterious since the math standard never mentions it. Instead the standard for the 6th grade expects students to “fluently add, subtract, multiply, and divide multi-digit decimals using the standard algorithm for each operation,” the processes most people learned in school. The standard does not mention cursive writing, leaving it up to the school to decide whether to include it. It should be noted that the Common Core should serve as a floor, not a ceiling. Students should learn at least what is in the Common Core but there is nothing to stop them from going beyond it. This is another mystery since “feelings” doesn’t appear in the math standard. It is doubtful that Gates would have said this and no source is offered. If there is any basis for this claim perhaps Gates expressed a desire that schools not use the Common Core to set limits on what is taught. The latest costs for the tests are about $24. This works out to about 0.2 percent of the cost per pupil in Wisconsin. In other words, for every $1,000 spent on education, $2 would be spent on the test, hardly a crippling amount. The next to final paragraph of this long comment above admonishes the reader “Do the research yourself.” This turns out to be hard to do since it offers no hint as to the source of its claims. The writing standard for 8th grade students expects them to “Support claim(s) with logical reasoning and relevant evidence, using accurate, credible sources and demonstrating an understanding of the topic or text.” It is unfortunate that the folks attacking the Common Core don’t seem to have attended schools that required students to learn to do this. The comment finishes with a flourish that could have come straight out of Rethinking Schools: the idea that giving students the skills they need to hold a job is turning them into corporate robots. The extreme right, it seems, is bending around to join the extreme left. While it may seem unfair to single out one set of comments for analysis, they reflect themes common to many of the attacks on the Common Core opponents: hysteria about the supposed death of the American republic, unwillingness to check out claims before passing them on or to reference sources, and the apparent inability to actually read the standards. Over at the Heartland Institute, for example, they apparently believe that the standards I quoted asking students to analyze basic American documents evidence a liberal plot to indoctrinate students. When Wisconsin had its own standards they were terrible: extremely general and only covering a few years, proving the rule that when large numbers of groups try to create something the result often represents the least common denominator. Surprising many of us, the Common Core, while not perfect, is very good, probably better than 90 percent of the existing state standards. Given the groups in Wisconsin that would demand a seat at the standards-writing table should Walker’s idea of rewriting them actually occur, it seems unlikely this would result in standards that equaled the Common Core. Resistance to common standards implies there is something about mathematics or English skills that Wisconsin kids need that differs from the needs of kids in other states. This is plain silly. American students do poorly in international tests. One culprit is our textbooks. Compared to texts from countries that outperform us, ours tend to be bigger but more superficial. One cause is our fragmented national market for texts, with every state and school district coming up with its own list of topics to introduce in each grade. Publishers know they will lose the sale if they don’t have every topic on the list, so the texts end up “a mile wide and a foot deep.” With common standards, publishers can be encouraged to develop texts with less width and more depth. 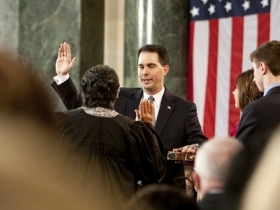 Why did Walker flip on the Common Core? When Eric Cantor was defeated in his primary by a Tea Party candidate, at least one commentator quoted the old Kennedy speech: “those who foolishly sought power by riding the back of the tiger ended up inside.” Walker has benefited greatly by the support of Tea Party groups. But as Cantor discovered, they are unforgiving of those who stray from the true path. My guess is that his political advisers warned him that if he continued supporting the Common Core a disillusioned tiger would punish him by not turning out in sufficient numbers in the upcoming election. What happens if the governor is reelected? Without the threat of the election will he drop the repeal of the Common Core or will he put Wisconsin through the cost and confusion of developing a new set of standards? As a candidate for president he may feel compelled to keep riding the tiger. Maybe we’ll be like Indiana and end up writing new standards that are extremely similar or identical to the common core. It’s said that a response to those loony mass emails is necessary. It’s like when Politifact rates them and they are always Pants on Fire because they are flippin’ insane. Seems like a waste of time. I understand people’s feelings on Gov. Walker in terms of his political beliefs (good or bad). I understand why politicians play lukewarm on certain hot button issues so as to try and appeal to swing voters. If Gov. Walker is against Common Core because of fear-mongering idiots, I don’t understand. Having a minimum national standard for education should not be controversial. If Gov. Walker’s advisors think he will lose the election if he doesn’t make that minimum standard controversial, he should fire them. I think the majority of Wisconsinites and Americans are mildly supportive of Common Core and minimum education standards in general if not necessarily educated on the details. I lose respect for a person elected to lead who bows to those who would lead us astray. So much for being unintimidated. Is he just trying to keep up with Marco Rubio and Bobby Jindal as he ponders a run for president?